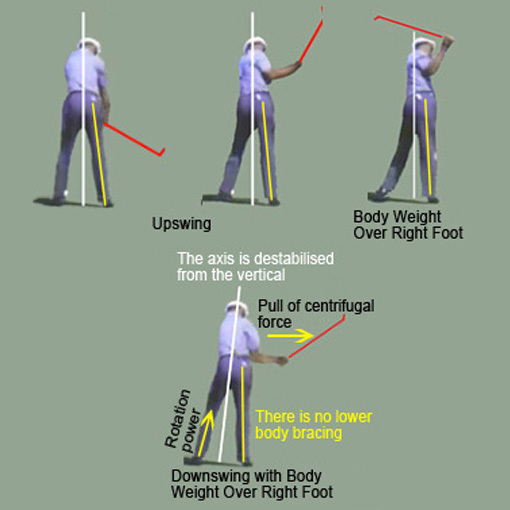 Body weight shift in the golf swing is essential for stability of rotation by providing bracing against the effects of centrifugal force and reaction to power forces flowing up through the feet and legs. In traditional practice; body weight is over the right foot at the top of the backswing. To achieve the necessary bracing the body weight must shift to the left foot with a lower body “bump” towards the target before commencing the downswing rotation. The right leg is then set as a bracing prop. This “bump then fire” action, which is present in the techniques of many elite players, requires considerable discipline in ensuring that the weight transfer is properly executed before commencing the downswing rotation. The need for the “bump” movement can be eliminated by a simpler technique in which the right leg bracing is preset by shifting body weight to the left foot as the upswing/backswing action progresses. This provides for positive stabilisation of the axis of rotation and a smoother flow into the downswing immediately upon reaching the top of the backswing. This preset weight shift was a feature in the great Ben Hogan’s technique and was probably a major factor in his renowned accuracy and consistency particularly in the later years of his career. It is important to understand the overall effects of dynamics in the golf swing. 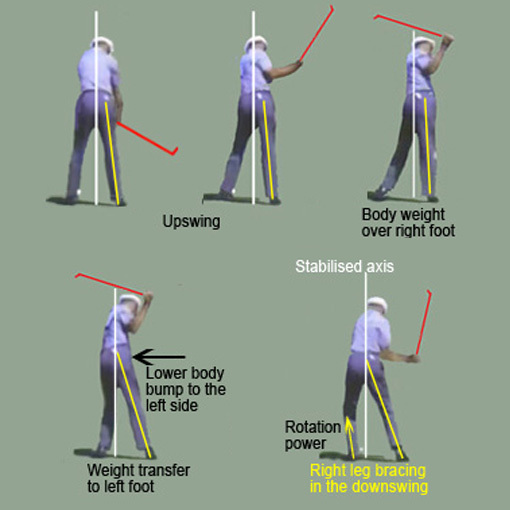 Retention of cocked wrists (lag) in the downswing, as illustrated in the last frame of the above series, ensures “on plane” club head acceleration while swinging the arms freely straight down and through impact in coordination with proper body rotation around a stabilised axis. 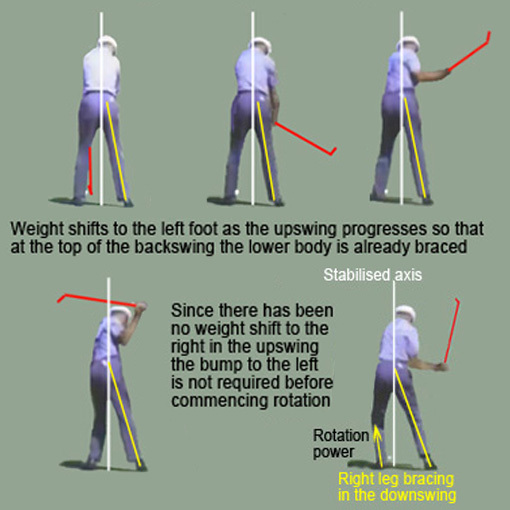 If the downswing of the arms is retarded (usually due to the body and its axis of rotation being out of position) then the wrists will uncock prematurely in an instinctive attempt to maintainthe club head acceleration.